Blueberries are such an easy berry to pick. No thorns. Just put your bowl under a bunch and rub the bunch. The ripe berries will fall into your container. They don’t all ripen at the same time, so don’t pick any that are not blue. At least try not to. If they have a bit of red or pink color to them they will be somewhat sour. Oh, well. Add some sugar. Apparently the berries that are not quite fully ripe will ripen at room temperature. This must surely be the explanation for baskets full of fully ripe berries at the grocery. 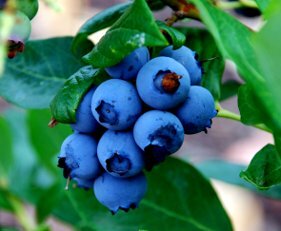 If you pick the berries in late afternoon shade, many will look fully blue, but that’s just the shade. I do this all the time, pick in the late afternoon, then find some berries not fully ripe. If they aren’t green or white, into the meal they go. I planted three bushes several years ago, in a neglected part of the yard. And promptly neglected them. Amazingly, they lived. 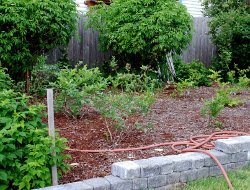 So when I got serious about creating a blueberry patch a couple of years ago, those forgotten bushes were transplanted into the patch. 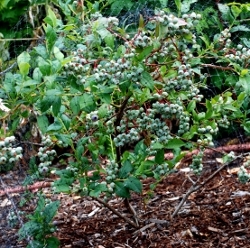 At blueberry patch creation, I purchased an additional 9 bushes: 3 early, 3 mid-season, and 3 late season. The old bushes appear to be early, as they have produced at the same time as the “early” varieties. I did discover that the bushes did not grow until I fertilized with an acid fertilizer, same as for rhododendrons. The bushes started to grow immediately. I’ll add more in the spring. Blueberries do need an acid soil, apparently mine was not quite to their liking. We have to put bird netting over the bushes as the berries ripen, otherwise the birds would get every berry. So it’s a bit of a trick to pick the berries. We just pull the hanging netting up over the bush to pick, then flop the netting back down. Keep an eye on the netting if you use it. I rescued a starling the other day. So on to the eating. Blueberries are fabulous on their own. Popped as snacks. Or on cereal. Or in smoothies (yum). Here’s a recipe from SimplyRecipes. It’s very good. Preheat the oven to 375°F. Grease an 8-inch springform pan. Set aside. Sift together the 2 cups of flour, the baking powder and the salt. Set aside. Cream the butter and sugar until fluffy, about 3 minutes. Beat in the egg. Add the flour mixtrue in 3 parts, alternating with the milk. Toss the beries with the remaining 1 to 2 tablespoons of flour (to separate and scatter evenly throughout the batter) and fold in. Pour batter into the prepared pan. Set aside. 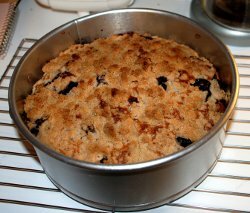 Combine ingredients for topping with a fork to make crumbly mixture. Sprinkle this over the batter. Bake for one hour, then test for doneness by gently inserting a fork. If it does not come out clean, give the cake another 5 to 10 minutes to bake. 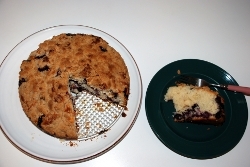 When the cake has cooled, run a knife around the edges and lift the cake out o the pan. Serve with whipped cream.